Orson Welles, Chimes at Midnight, 1965, 35 mm, black-and-white, sound, 115 minutes. Doll Tearsheet and Falstaff (Jeanne Moreau and Orson Welles). 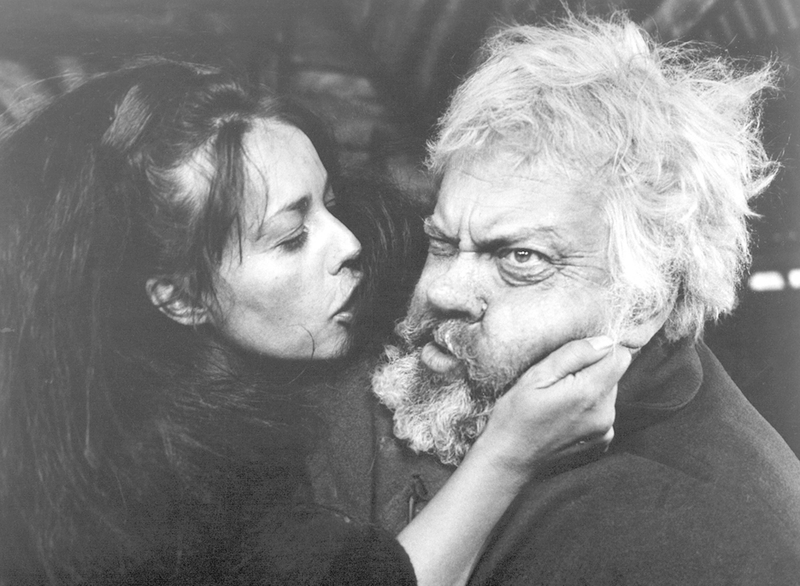 Just a few years earlier, the narrowing of Welles’s range and the expansion of his waistline had coincided to create his last real signature performance playing a character other than “Orson Welles”: his portrayal of Sir John Falstaff, the bloated, boisterous companion of Prince Hal, in his film Chimes at Midnight (1965), a mashup of the Bard’s “Henriad” histories which will be enjoying a weeklong run at Film Forum in a new DCP restoration. Chimes collates material from the plays in which Falstaff appears as a character with dialogue—Henry IV Part 1, Henry IV Part 2, and The Merry Wives of Windsor—as well as from Richard II and Henry V, and discovers in them a narrative throughline: The abandonment of Falstaff by bosom companion Hal. As the film begins, King Henry IV (John Gielgud) has newly wrested the crown from Richard, but Henry’s son, Hal (Keith Baxter), is disinterested in being groomed for the throne, preferring to while his youth away in prankery and dissipation with Falstaff at the Boar’s Head Tavern, a huge, timbered theater where the rafters ring with laughter, as opposed to the King’s cathedral-cold echo chamber. 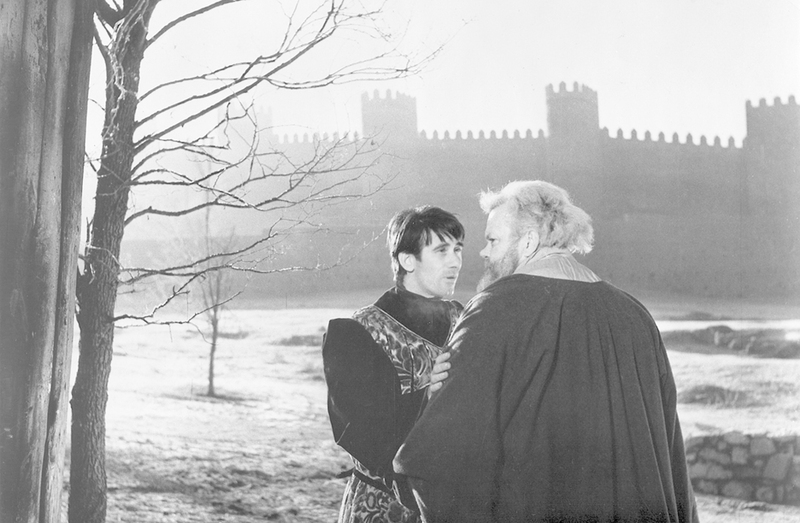 A rebellion against the king builds under the Earl of Worcester (Fernando Rey, obligingly dubbed) and young Hotspur (Norman Rodway), who Henry admires as a substitute son just as Hal looks up to Falstaff, if askance. Hal’s sowing of wild oats is, as he knows all along it must be, interrupted by the call of duty, and he vanquishes Hotspur on the field at the Battle of Shrewsbury—a stirring montage that descends into a mud-caked melee, and the most overpowering scene of its kind to appear between the respective primes of Akira Kurosawa and Sam Peckinpah. Hal emerges from the battle changed, and the tone of the film changes with him, its former lightness replaced by a creeping elegiac note, as Hal bids goodbye to his feckless youth. Naive Falstaff is the last to know that his Hal has become a regal Henry, and the knowledge destroys him. Retrospectively it seems as though Welles had been laying the groundwork for his Falstaff and Chimes at Midnight for his entire creative life. The director’s engagement with Shakespeare began early, and via Shakespeare Welles would continue to work through some of his principal preoccupations—the exercise and abuse of power, the relationship between private and public personae—for all of his years. At the Todd Seminary for Boys in Woodstock, Illinois, where Welles was a gifted pupil, he first attempted to stage an omnibus production of Shakespeare’s histories, The Winter of Our Discontent, and with the school’s headmaster, Roger Hill, would coauthor a book offering guidelines for the teaching the Bard called Everybody’s Shakespeare. (“Shakespeare said everything,” begins the seventeen-year-old Welles’s introduction to the book. “Brain to belly; every mood and minute of a man’s season.”) Welles’s dizzying rise to early celebrity was accomplished in no small part through daring stagings of Shakespeare: His so-called Voodoo Macbeth of 1936 for the Federal Theatre Project, set in the Caribbean and using an all-black cast, or his 1937 Caesar, the inaugural Mercury Theatre production, which drew a direct analogy between the end of the Roman Republic and the contemporary rise of European fascism. (In 1939 he tried to make his portmanteau play following the Falstaff throughline, Five Kings, but the production disintegrated in rehearsals.) During his first self-imposed exile from Hollywood, Welles would direct and star in films of Macbeth (1948) and Othello (1952), and we are still discovering Welles’s Shakespeare—a reconstruction of his fragmentary The Merchant of Venice (1969) premiered at the 2015 Venice Film Festival. While DCP rep programming should usually be a matter of last resort, the appearance of a reasonably watchable Chimes at Midnight in any format is cause for celebration. For years the film has been encountered in only the most degraded conditions—for me it was in university, on a bootleg VHS with a noisy sound track that swallowed up the iambic pentameter—but it has here been rescued from rot by Janus Films, embellishing on the work of the Filmoteca Española. (It is expected to be released on home video by the Criterion Collection before the end of 2016.) Even the early release prints of the film that initially appeared stateside were marred by muddy audio and an out-of-sync first reel, elements which are central to Pauline Kael’s sympathetic if skeptical contemporary review of the film in the New Republic. Orson Welles, Chimes at Midnight, 1965, 35 mm, black-and-white, sound, 115 minutes. 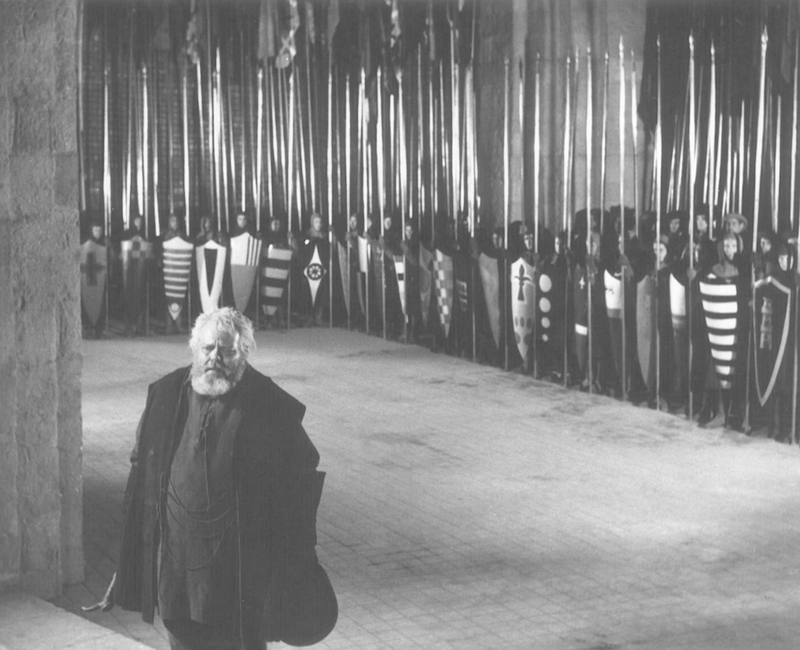 Falstaff (Orson Welles). Now Chimes at Midnight can be watched in something near to the form that it was intended to be seen in, and it appears as one of the very pinnacles of Welles’s art, matching a forceful, visual dynamism to a melting, mellifluous reading of Shakespeare’s text. Welles, filming in Spain, was as ever flying by the seat of his pants—he parted producer Emiliano Piedra with his money by promising a movie of Treasure Island which never emerged—but enjoyed a relatively uninterrupted shoot, a rarity in his vagabond years when he was often driven to suturing together bits of film shot years and continents apart. Welles was nearing fifty when he played Falstaff, wearing a cotton-ball beard and augmenting his already considerable bulk to attain planetoid rotundity. Contrary to Welles’s statement to Bogdanovich, his Falstaff is more convincingly young than Charles Foster Kane ever was old, combining Welles’s boyish, twinkling insouciance with the heft of accumulated years. Like Welles, who obligingly appeared on the talk-show circuit to sing for his supper in later years, Falstaff will lampoon his own obesity and age to win over a crowd, but he only truly grows heavy and old when Hal turns away from him. It is Hotspur, slain on the field of battle, who speaks the line “O Harry, thou hast robbed me of my youth,” but the words might just as well belong to Falstaff, for his fate is sealed when he ceases to believe in friendship. Like Welles’s film of Don Quixote, another project never completed in his lifetime, Chimes at Midnight reflects the director’s proclivity for out-of-step dreamers who prefer their lovely, useless fancies to cold, pragmatic practicalities. Welles’s Falstaff played on the public perception of the genius of Citizen Kane (1941) as a prodigy who had squandered his gifts and advantages. Living with the character may also have been a way for Welles to get closer to the ghost of his father, Richard Head Welles, who had made a fortune by inventing a bicycle lamp, then drank it all up and died young. Rather than establishing proprietorship, these deeply felt personal touches open up the material, make it into Everybody’s Shakespeare. Welles’s Sir John Falstaff is a splendid fraud, the outrageous liar at the VFW hall whose history becomes more heroic with every downed boilermaker, or the lecherous lifelong hanger-on who has somehow sustained himself in a state of nonstop carnival; Baxter’s Hal every rich boy who passes a season in bohemia before answering the prerogatives of class duty. It gives us Shakespeare as a spree, complete with its Saturday night and Sunday morning comedown. Orson Welles’s Chimes at Midnight plays Friday, January 1 through Tuesday, January 12 at Film Forum in New York.